On several sites, I’ve noticed a type of email subscription modal pop-up message that can’t be closed by clicking an “X” in the corner, but instead requires clicking on a sentence that describes what you’re refusing. 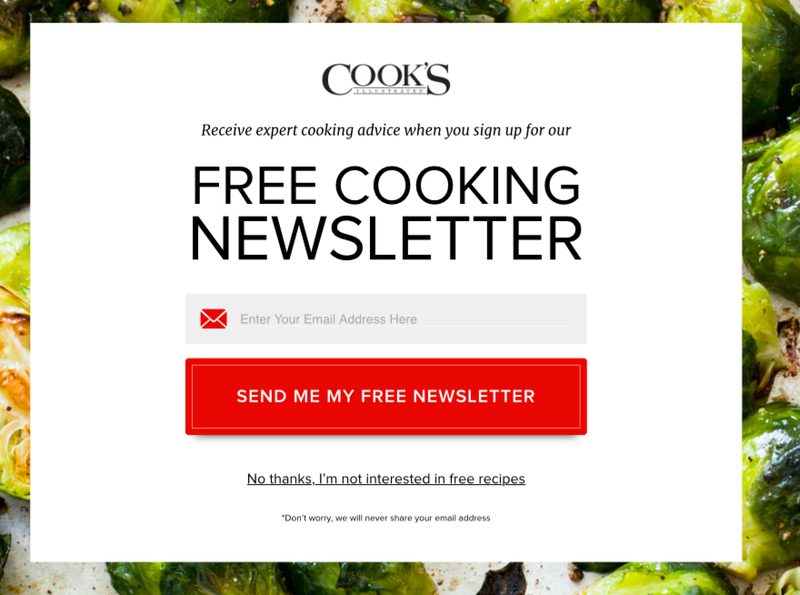 To close the dialog, you have to click "No thanks, I'm not interested in free recipes". I was wondering what difference it makes to user experience (have any studies shown that it has benefits?). What evidence is there about the effects of these two ways to close a modal email subscription popup? Such a method of closing makes the user look at the popup for a longer while as they actually have to read through it to find how to close it. This means that a user is more likely to actually take an action from the popup. Also, writing something like No thanks, I prefer to waste my time searching [for something] will once again make the viewer think about whether they shouldn't take the required action like entering their email. Some reasons include the fact that some may not notice the 'X' in the first place or be unsure what it means or that it even does anything. Even today some people are unsure of what the hamburger menu is. Don't give too much credit to the general population. The "No" phrase is a chance to encourage a visitor to still take a positive action. Personally, I find the phrase used in many of these cases insulting. Not the answer you're looking for? Browse other questions tagged website-design popup modal-windows subscription or ask your own question.